Top Animation News: Paradise P.D., MIPTV, Steven Universe and more! Top Animation News is a weekly column that rounds up the biggest, best and breaking stories from the world of animation. This edition covers March 30 to April 06, 2018. 1. Netflix’s Paradise P.D. being produced in Toon Boom Harmony. In the escalating adult animation war between streaming giants Amazon, Hulu and Netflix, the latter has unveiled its latest weapon: Paradise P.D.. The half-hour, 10-episode comedic series follows a small-town police department staffed by near-criminally incompetent officers. Paradise P.D. is the brainchild of Brickleberry creators Waco O’Guin and Roger Black, and is being produced by Bento Box Animation in Toon Boom Harmony. Be arrested by the Paradise P.D. story on “Variety’. 2. Toon Boom is headed to MIPTV and Cartoons on the Bay this month! Toon Boom will be at MIPTV 2018 in Cannes, France, from April 09 to 12 with a delegation including Francois Lalonde (VP, sales and marketing), Daniel Santos (Sales Director, Europe), Bernard Boiteux (Sales Director, Asia) and Matthieu Sarazin (Sales Agent, France). The team will be taking meetings and doing demos at the Corus/Nelvana booth, located at R7.N5 in Riviera 7. Daniel Santos will also be part of a panel at Cartoons on the Bay in Turin, Italy, on Saturday, April 14, which will be moderated by Federico Vallarino (Sales Agent, Italy) and feature representatives from Guru Studio, Mercury Filmworks and the Ottawa International Animation Festival, among others. For more on Toon Boom at MIPTV 2018 and Cartoons on the Bay, visit the events page. 3. Are high school animation programs the future of education? It’s no secret today’s digital generation has fleeting attention spans that must be earned by engaging, creative course material — like animation. Franklin High School has already seen how a cartoon curriculum can not only lead to academic success, but awards. By teaching future-proofed, industry-leading digital solutions like Toon Boom software, secondary schools can offer the creative, career-oriented courses students want in the blended learning environment they need. 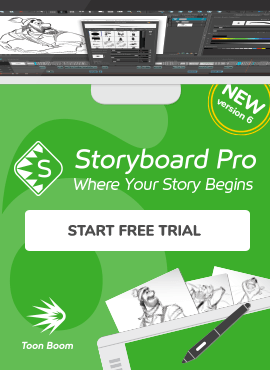 Study up on Franklin High School’s animation program on the Toon Boom success stories page. 4. Over 25 percent of LA-area animation employees are women. In a male-dominated industry like animation, every percentage point counts when it comes to female inclusivity. According to the Los Angeles’ chapter of The Animation Guild, of the 4,230 artists, writers and technicians in the area, just over 25 percent are women. While a quarter may not seem like a lot, it’s been steadily increasing since 2015 when it sat at 20.6 percent. Notably, bigger studios tend to have more female employees — for instance, Cartoon Network’s staff is 39.1 percent women. See the full studio LA animation gender breakdown on “Animation Magazine”. 5. Dove and Steven Universe partner for girls’ self-esteem. It’s been a good week for women and animation; beauty brand Dove and Cartoon Network’s Steven Universe joined forces to promote young girls’ body positivity. The two-year partnership will include six short films directed by series creator Rebecca Sugar, which will be released alongside an original song performed by the cast and an educational e-book. Steven Universe, produced in Toon Boom Storyboard Pro, has received much praise for its depictions of diversity and difference, particularly in the case of LGBT characters. Dig into the Dove x Steven Universe partnership on “Fast Company”. 6. Pixar’s new animation technique is fleshy freakiness. Most audience members probably don’t think about what it takes to make the flesh of a Pixar character look realistic — that’s the animator’s job. A team from the studio including Breannan Smith, Fernando de Goes and Theodore Kim has created an approach called “Stable Neo-Hookean Flesh Simulation”, which combines mathematics with the mechanics of movement to avoid cartoonish stretching and folding. Watch the video above for a better explanation or read the story on “Motherboard’. 7. Yellow Submarine is swimming back into theatres. In celebration of its 50th anniversary, the Beatles’ classic hand-drawn 2D animated film Yellow Submarine will be back in North American cinemas on July 08. The film is being restored in 4K digital resolution, with the original photochemical elements being retouched by hand, frame-by-frame. Yellow Submarine was directed by George Dunning, with an animation headed by Robert Balser and Jack Stokes. Tune into this classic toon on “Rolling Stone”. 8. Big Fish and Begonia is like Studio Ghibli, only made in China. It’s clear Hayao Miyazaki’s anime inspired Liang Xuan and Zhang Chun, the Chinese animators behind modern fairy tale Big Fish and Begonia. The film’s fluidity and magical realism are an homage to Studio Ghibli, and mark a leap in China’s rapidly evolving industry. Launching this weekend in American cinemas, Big Fish and Begonia has already earned $89 million at the Chinese box office, making it the country’s highest-grossing fully animated feature of 2018 so far. Be amazed by the Big and Begonia trailer above and read the full preview on “VICE”. 9. Coco's Lee Unkrich wants more live-action directors to do animation. With Isle of Dogs getting critics’ and audiences’ tails wagging, Lee Unkrich (Coco, Toy Story 3) says more live-action directors should follow Wes Anderson’s lead and make animation. “I don’t think the two worlds need to be so segregated. I think the work that we’re doing in animation is very much on par with what’s being done in live-action, and the way we make the films is similar, so it kind of makes sense for there to be cross-contamination between animation and live-action these days,” says Unkrich. Get more details from Lee Unkrich’s interview on “IndieWire”. 10. Villainous creator Alan Ituriel shares his experience in the industry. “Cartoon Brew” caught up with animator Alan Ituriel at Pixelatl Festival for the publication’s My First Animation Job series. Though just 24 years old, the young artist has been working in the industry since he was a teenager and is the creator of Villainous, Cartoon Network’s first short-form animated series commissioned from Mexico. Catch Alan Ituriel’s quick interview above and read more on “Cartoon Brew”.